App Onboarding: What Is It and Why Do We Need It? Onboarding is one of the most critical phases in an app user’s journey. App onboarding is primarily the first point of contact and therefore is essential for making a great first impression. As a result, it is important to make this process as simple and seamless as possible. According to Go-Globe, 85% of people now prefer native mobile apps to mobile websites. However, it is difficult for new users to intuitively know how to navigate and get the most from a native app. This is where user onboarding comes into play. Onboarding is an important feature that helps guide your users through and familiarise them with the app. This process enables businesses to strategically communicate with their users, expressing the app’s value and facilitating a positive user experience. Collect profile information that can be used to deliver personalised content and notifications. Onboarding that demonstrates the benefits or value the user will get from the app, in an attempt to encourage conversion. This approach describes what the app does without explicitly stating how to use the app. With a focus on app functionality, this approach teaches the user how to use the app. More specifically, function-oriented onboarding shows users how to get started and how to perform common actions. This approach shows users new information as they progressively navigate through the app. The information displayed on the screen at the time is in relevance to the page the user is on. No matter what the approach, onboarding should empower users and encourage them to learn through exploring the app interface. App onboarding enables businesses to facilitate a positive user experience, creating a successful first impression essential for app retentionClick To TweetApp onboarding allows businesses to optimise a user’s first interaction with an app. Creating an engaging first-time and positive user experience is fundamental to app success and fostering ongoing user engagement. Users quite often lose interest when an app is confusing and difficult to navigate. Utilising app onboarding helps make the first-time user transition as seamless as possible, minimising potential pain points. It is important not to overwhelm users with too many input fields at once. In order to keep users engaged and paying attention, make sure copy is short and to-the-point. Simply tell the users what they need to know in as few words as possible. A good guideline is no more than 10 words on a screen at one time. The onboarding process should be warm in tone, simple and quick. Try to adapt your messaging based on the actions of the user, making the experience as intuitive as possible. What works best is dependent on the complexity of your product, and the savviness of your users. Short tips and notifications can be a good way to guide new users through the process. However, steer clear of surprising them with unexpected pop-ups or messages. Instead, try and prepare users for any upcoming steps. Communicate how much is left in the process and acknowledge your users when they complete a step. This will help encourage them to finish and complete the onboarding process and will provide a more fluid experience. Remember to also make users feel welcome and to thank them for their time. Monitoring usage and app analytics can help provide insight into which users are experiencing problems in the app and where. Tracking where users succeed and fail during the onboarding process can help you mitigate any potential pain points. 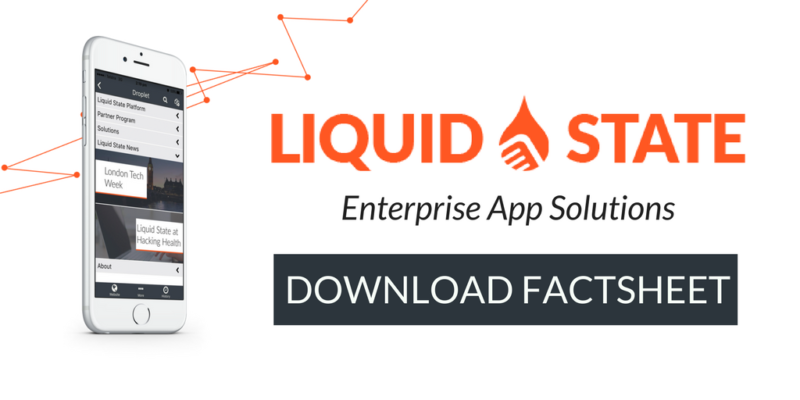 At Liquid State, we understand the importance of implementing enterprise mobile app software as a part of corporate strategy. Our platform empowers businesses to build native code-free, cross-platform apps for a variety of business functions. To find out what Liquid State can do for your business, get in touch with us today.